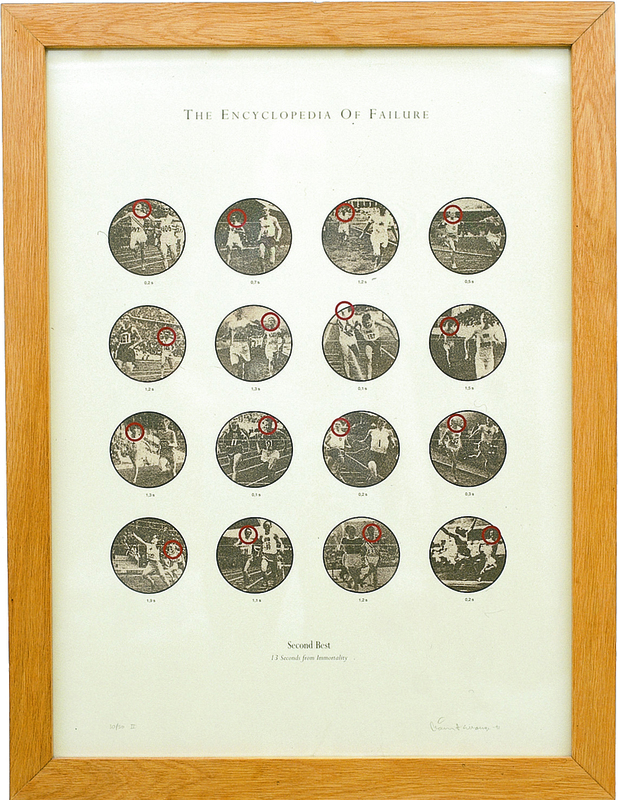 A project which investigates the different cultural, psychological and philosophical aspects of failure, spanning over phenomena such as notions of mediocracy, second-best in sports, primal scream therapy, Ingmar Bergman's demons, stock market crisis, forgotten movie stars and writers' block. Almost every aspect of human behavior is classified in terms of “success” or “failure.” From birth we are socialized into a binary structure of winners and losers through playing games, sports and school. This dichotomy is institutionalized in adulthood in terms of professional careers and social status, where we live, , salaries and so on. Even in the private spheres of life, like love and the family, we are ranked as “successes” or “failures.” society’s definition of this conceptual pair is largely decisive of how we evaluate our lives and it is normative for our choices and actions. “Success” and “failure” are, thus, essential categories for sustaining and legitimizing the modern structure of society based on continual progress. What we define as success and failure and how we define it depends to a large degree on who has the privilege of formulating problems and this differs between cultures. Unlike the USA, for example, whose self-conception and motive force is provided by the American dream of individual success, during the last century Sweden built up a welfare state that gave priority to the collective prevention of individual failure. But not everybody seeks primarily for success but they have more realistic expectations in life: they simply want an agreeable and bearable situation. But few people consciously seek failure. From both an existential and a clinical, medical concept, life can be said to consist of a continuous delaying of an inevitable and absolute failure: death. From this argument one might draw the conclusion that the way in which we define failure has been more formative, culturally, psychologically and politically, than how we define success (even if the definitions of the two concepts are intimately connected). 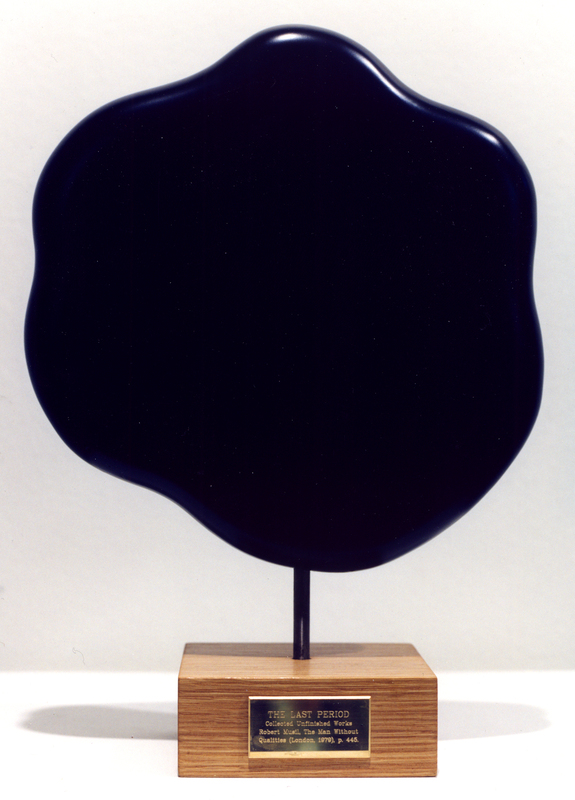 The Unfinished Book (Collected Frustration) 1998. 130 x 40 x 40 cm. Print on paper, leather, wood, glass, metal and various electronics. Presented at "The Silk Purse Procedure," Arnolfini Art Center, Bristol, 2001. Collection AKZO NOBEL Art Foundation, Arnhem. A circular book without a beginning or an end. The book consists of the last pages of unfinished novels by both anonymous and world renowned writers. The last page shows where writer’s cramp and frustration have replaced the creative act. This determines a concrete boundary between activity and passivity, between success and failure. To read the book, the viewer must scream out his or her frustrations into the mouthpiece below the book. This causes the book to rotate and then stop at random on a new page. 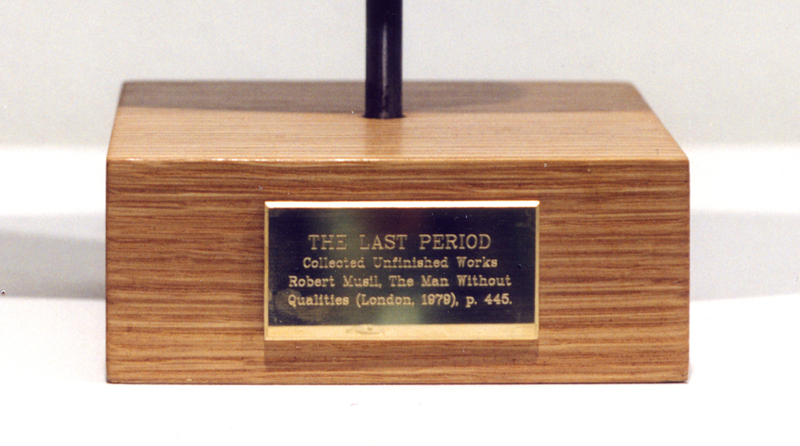 The Last Period, Collected Unfinished Works l - V, 1998. 20 x 20” x 2,5 cm. Lacquered wood, engraved brass, iron. Private collection. 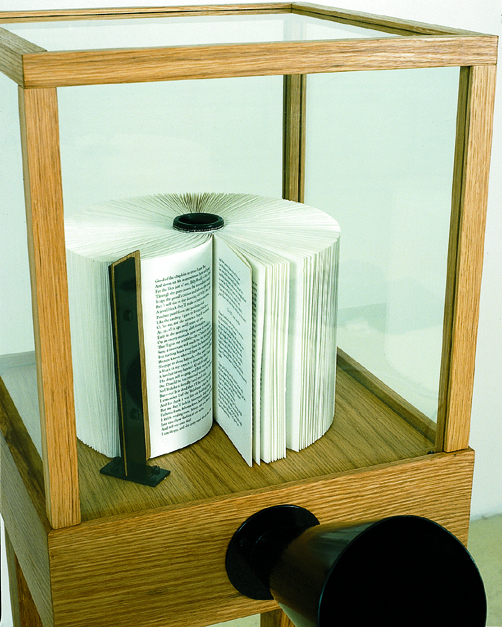 Periods in a selection of unfinished novels, enlarged as many times as the number of pages of an average novel, and made into large three-dimensional amorphic sculptures. Each period marks the point where the writer failed to complete his novel. The above artwork is one out of a series offive sculptures of last periods of famous unfinished novels: The Man Without Qualities by Robert Musil, The Castle by Franz Kafka; Convivio by Dante Alighieri; Sanditon by Jane Austen, and Billy Budd by Herman Melville. Detail. Below each sculpture there are biographic facts — author, title, year and the last page number where the period was found — engraved in a brass plate. 1991. 75 x 55 cm. Lithographic print on paper. the winner is seen breasting the tape. Detail. 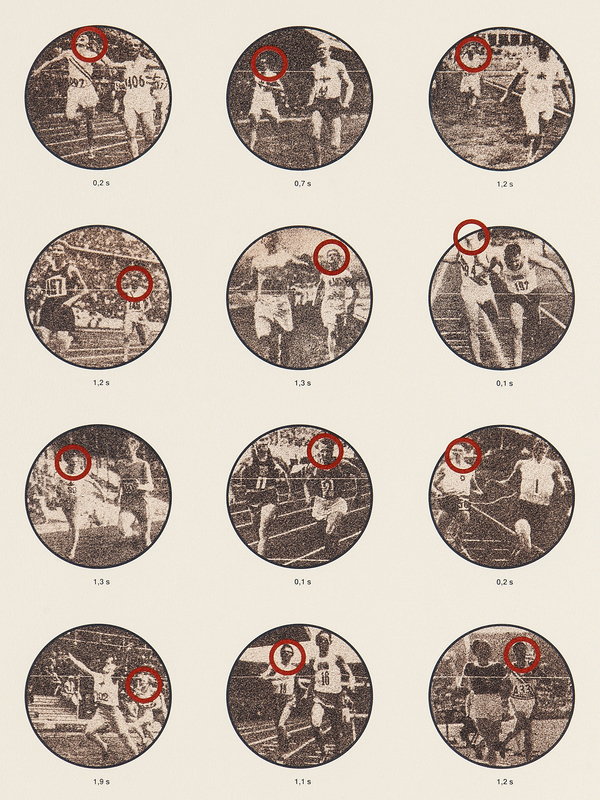 The runner who finished in second place is ringed on each image, and the exact time difference between the winner and the second best runner is indicated below the image. The total difference in time for the sixteen races amounts to 13 seconds.